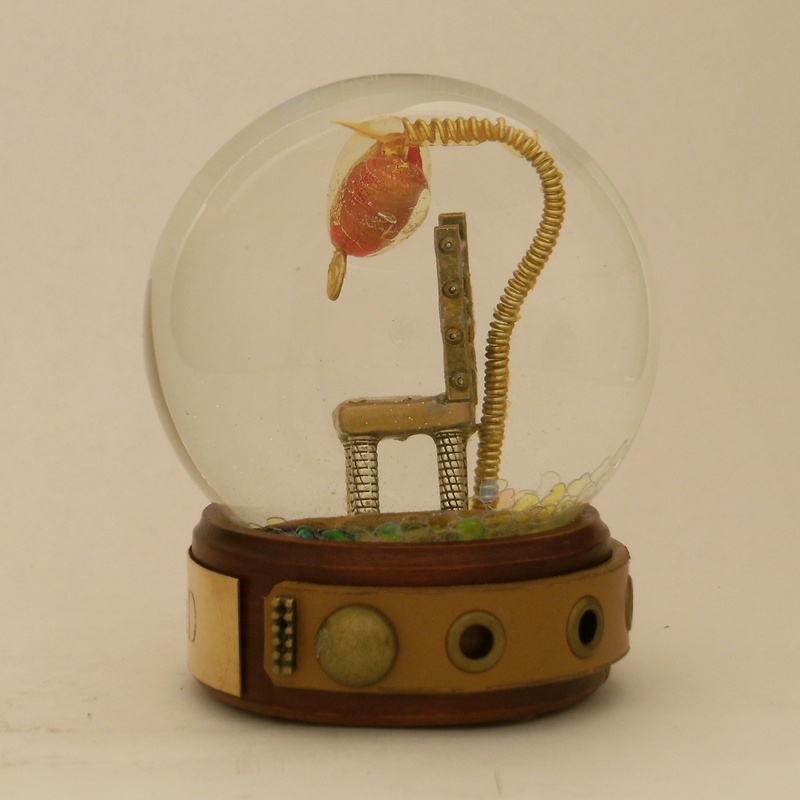 I was looking for a particular photo to explain how this snow globe, “Tesla’s Workshop,” came to be. When I was introduced to Mr. Tesla, far too late in my life for any reasonable explanation, I was fascinated with the Tesla coil and alternating current and how Tesla generated energy. Or managed it, directed it, whatever it is he did. If you’ve never heard of Tesla, that will give you a taste. Not the deep down scientific awesomeness that is so significant my head hurts just trying to grasp his genius, but enough to make you think: how come I don’t know more about this guy? I mean, he was BFFs with Mark Twain and all that. I am hoping this blogger comes forward (unless I’m totally dense, I could not find his/her name on the piece), but you never know. The last entry was in fall of 2011. Makes me wonder. Will someone find THIS blog someday and be saying: Why did she quit writing? But for now, I write when it strikes me and the rest of the time I am either making snow globes — or making money to buy supplies. It’s a life. But when I discovered Tesla, this image below intrigued me. I loved that at the turn of the century (the last one, in the early 1900’s) this man built these outrageous machines, spewing sparks and currents and man-made lightening, and pretty much cooking the bacon on your BLT before you could say How d’ ya do? People must have been mystified and shocked to see such a thing, when they were still using candles and oil lamps half the time. But Tesla, he’s not impressed. He’s the honey-badger of science, just sitting in his workshop, reading the funny papers and not even noticing that the ceiling is a glittering outpost of electicity over his head. This is one calm dude. While I usually just make tiny “curious inventions” in my snow globes, I was struck by his focus and calmness (under fire), and I thought a fitting tribute was to add a tiny Tesla to my snow globe for perspective. Shake this globe and watch the sparks fly! When people write a blog, sometimes they pour out their hearts to strangers, and tell you everything about how they think and feel. There is an emptiness and an ache when someone you love is no longer there, whether separated by miles, misunderstanding, or another type of finality. My heart grieves for those who are not here with me, but whom I can still see when I close my eyes. It’s a big honor to have our snow globes displayed in a museum! Five unique snow globes created by Camryn Forrest Designs are on display for the rest of November and all of December as part of the “Celebrating Snow Globes” exhibit at the Sandwich Glass Museum in Sandwich, Mass. This is about an hour’s drive from Boston, or an hour’s drive from Providence. If you go there, you’ll see an entire collection of snow globes, both antique and modern. Airship Voyager, Uncharted Skies, Sacramento Steampunk Society snow globe (courtesy Collection of Doug Hack), Ray Gun One, and Circular Logic snow globes. 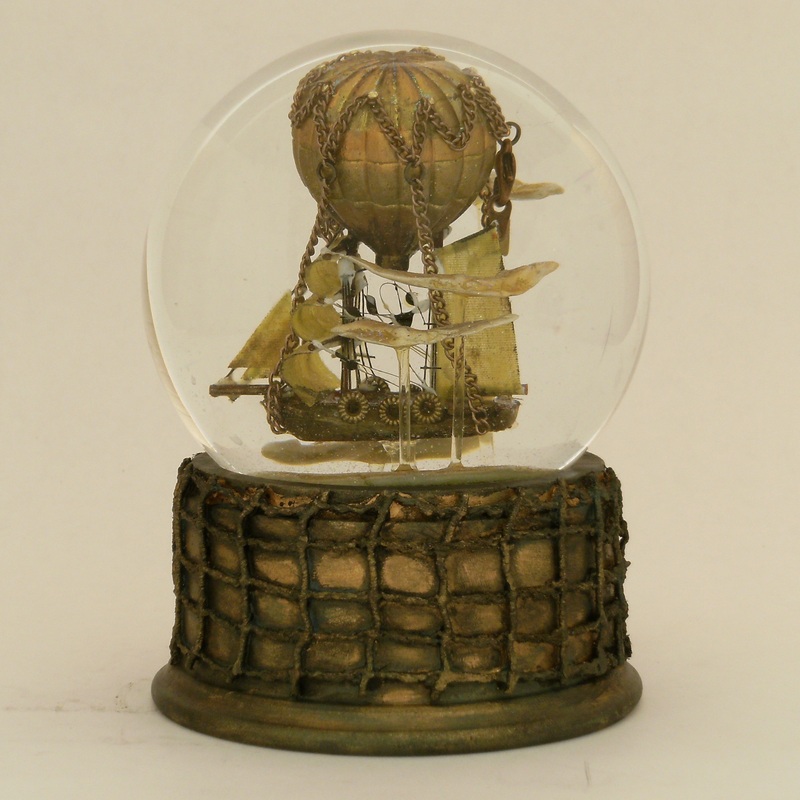 And bonus: the Airship Voyager snow globe is the featured globe on the front of the Sandwich Glass Museum December brochure. So cool! Where would you go, and how would you travel? Dances with Clouds … a battered airship carried by a hot air balloon, drifting high among the tatters and wisps of clouds. Sometimes you write a story and create artwork which illustrates the tale, enhancing the details. And sometimes, as with “Dances with Clouds,” the artwork writes its own story without a word needed. Sailing from one adventure and toward another, what story does it tell you? Ever heard the saying “it’s not a level playing field?” I’m a football fan — don’t laugh, I swear it! And in recent years, the teams I’ve been following struggled. More than a little. There’s not a lot of ways to put this nicely, but sometimes it just looks like we aren’t on the same page, or in the same book, or even in the same library. And boom goes the dynamite! What captures this season for me is how everyone is doing their job, doing what they should do and still … still … apparently not able to play the game as a team, as a unit. The quarterback throws on one plane, the wide receiver runs on another, linemen are upside down and sideways. Yep, looks familiar. Why is it that some teams take a deep breath and think and act as a single entity, and others, full of heart and life and talent, can’t seem to find their way? Heck, if I knew that, I’d be coaching. For real. I figure mixing M.C. 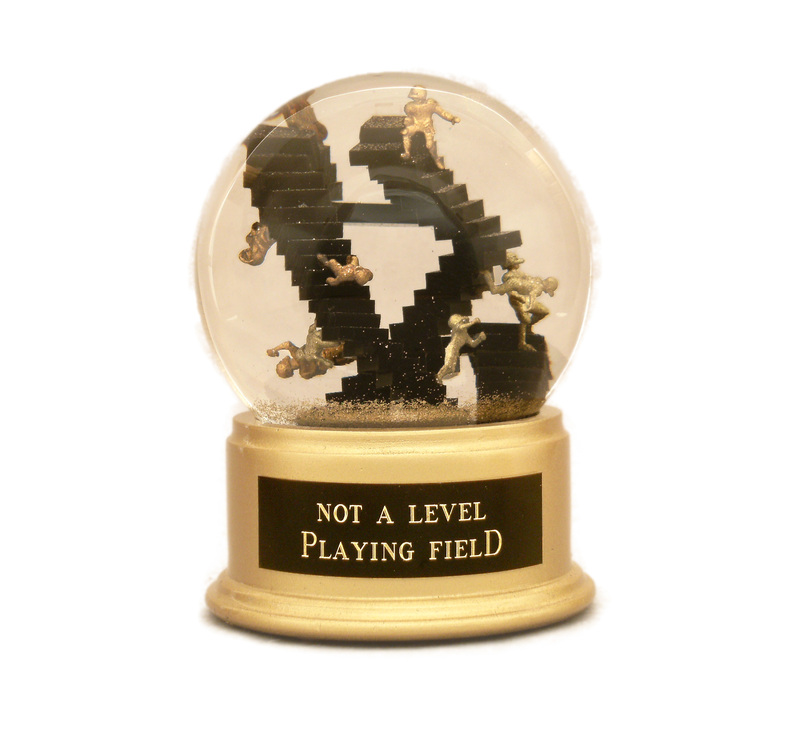 Escher’s warped staircases and American football in a snow globe makes just about as much sense as our season. All images and designs copyright (c) Camryn Forrest Designs, Denver, Colorado. Who really knows what a worm hole looks like? Is it a shimmering spot where one passes through to the other side of space? A spot of Jell-O in the fabric of the universe? Or perhaps it looks like some kind of space-age vacuum cleaner carwash? You won’t know until you try it. This snow globe was an exploration of a rocket, being pulled into a force-field or perhaps, the galactic car wash. I’m never sure until it comes out on the other side, spit-shined and gleaming bright, or if it vanishes into uncertain darkness. But the pull into the liquid-filled tube is undeniable.